As most of you know I took over American Angler last summer and have been ripping through manuscripts, trying to bring the mag into the modern world. How-to is fine, which is what American Angler was, but I feel like you can get that info online or in book form and that magazines should offer something better . . . like a story to go along with the dirt. You’ll find that in the coming issue, which should hit newsstands in the next week or so. I took a warmwater focus with this one, because there is more than trout and salmon and steelhead swimming around out there, and because I think muskie and pike are cool. You can read about 50-inch pike in Saskatchewan, chasing (and eating) shad on the Delaware, casting for muskie in Wisconsin, going all night for striped bass on dock lights, and you can read two fantastic pieces about panfish—bluegill and sunfish. The later piece is written by the late George Carlin’s longtime manager Jerry Hamza. Any story that involves an isolated, deserted lake, scorching sun, a gallon jug of Boone’s Farm, and 40 slab size sunfish and bluegill in the cooler is one I’ll read. You’ll also find a stories on . . . a “Fish Dog” in the Keys that points the ladies; how New Mexico’s Gila trout survived massive fires; three warmwater flies that cover all situations; fish guide Rachael Finn; fish sculpture and fish prints; how to teach kids to fish; hatches for smallmouth bass; Idaho’s walleye invasion (you might want to fish them); and a 17-year cicada hatch. Cover by British Columbia skull artist Nick LaFerriere. Pick it up at B&N or subscribe. And let me know what you think of it. This entry was posted in Books, Culture and tagged American Angler magazine. Bookmark the permalink. I loved what you were doing at Fly Rod and Reel and was very disappointed when that went away. 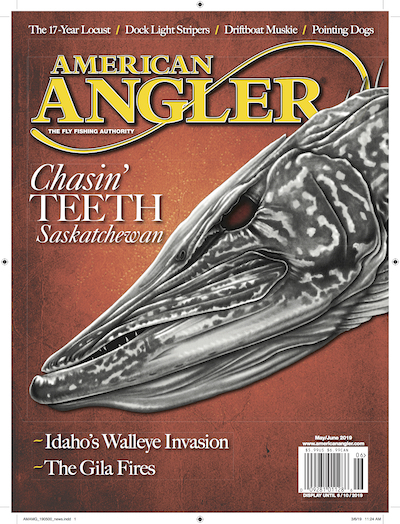 Could never get to excited when I would check out American Angler at the newsstand. Once I saw you were the new editor I new some good things were about to happen with that magazine. Great job I now have anothe quality fly fishing magazine to enjoy. Thanks for the kind words Jim. I’m enjoying the work and seeing AA morph into something we can all enjoy.